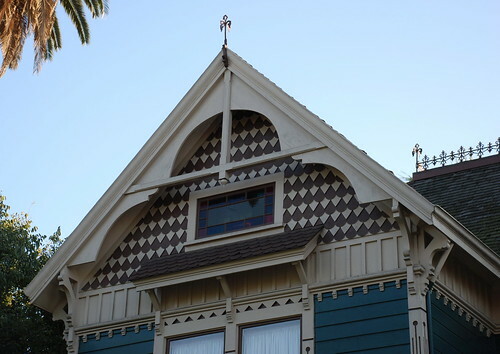 Check out the ‘witch’s hat”, fish-scale shingles, and loads of spindles on this 1894 house, the last Victorian home built on the 1300 block of Carroll Avenue. 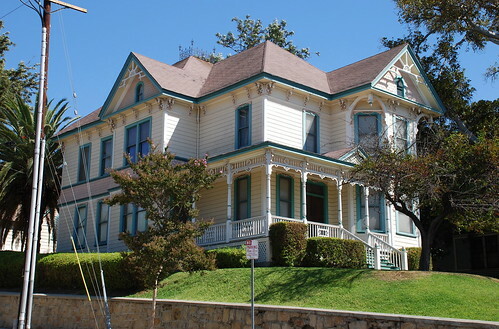 Real estate man Charles C. Haskins built the home. Today it’s often referred to as “the gay Nineties House”. In 1939, this building was a single-family home with six people between the ages of 20 and 64. 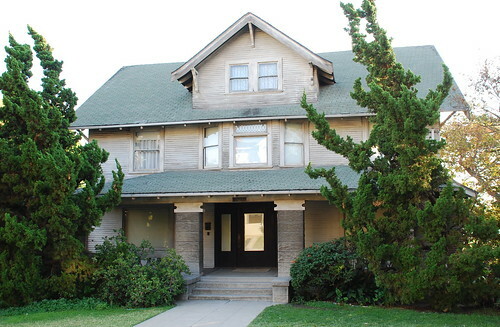 That's according to a WPA census, which also gives 1899 as the year the house was built. The construction dates of other homes in that same census seem way off, so take that for what it's worth. I should point out construction dates for this landmark vary from source to source (for instance, Gebhard and Winter maintain, due to the home’s “pure example of Queen Anne expansiveness” and the lack of spool-work and Eastlake ornamentation, the building could date with the rest of block’s 1887 houses or even earlier). I’ve chosen to go with 1894, the date given in the L.A. 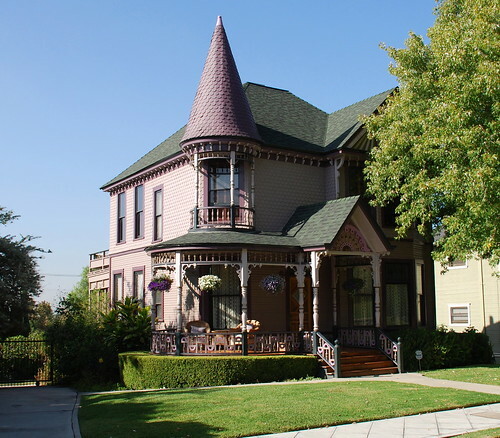 Conservancy brochure, Angelino Heights: The Victorians of Carroll Avenue, a reference I’ve stuck with a lot through this clump of Carroll Avenue monuments. Also, the Conservancy brochure is the only place I’ve seen the original owner’s name as Haskins rather than Haskin. Please don’t allow the discrepancies to keep you awake at night. 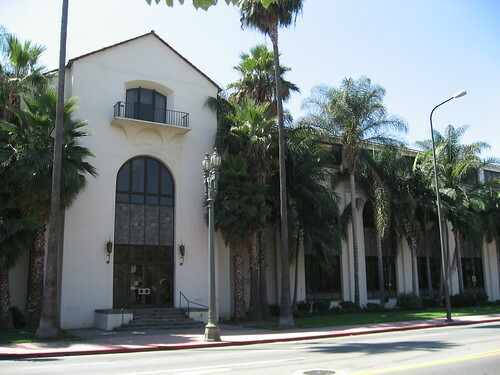 Finally, as a bonus, another one of those buildings on the block not designated a city landmark (although, as part of the block’s overall designation, it is listed on the National Register of Historic Places; it’s also part of the Angelino Heights HPOZ). It’s this four-unit apartment building, next to the Haskins House, on the southeast corner of Carroll/Douglas. 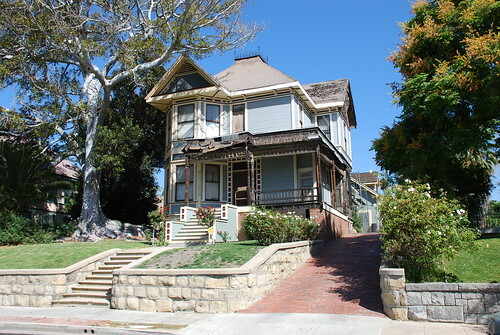 The Picture Album of Historic Angelino Heights, published by the Carroll Avenue Restoration Foundation in 1987, says oilman Peter F. McManus built this California Bungalow-style residence in 1902. Other sources report the construction date was closer to 1912 (or later). That 1939 WPA census I mentioned above records the year built as 1900 and 1926 for the year it was converted into apartments. It also makes notice of 1354 1/2, the fifth apartment in the rear, which is the last place I'd want an apartment. 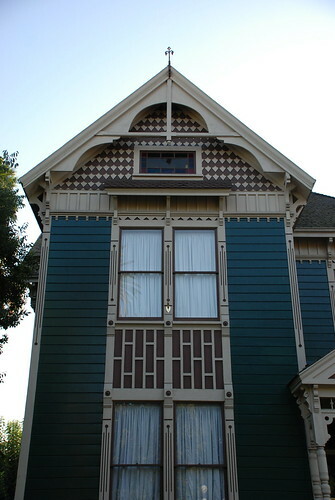 The penultimate home on this run of seven Carroll Avenue monuments, this Queen Anne house is a terrific example of a pre-fab style of Victorian architecture. The original owner, businessman John Scheerer, probably chose the layout and materials from a retail catalog or “plan book” (anybody have a link to one online?). 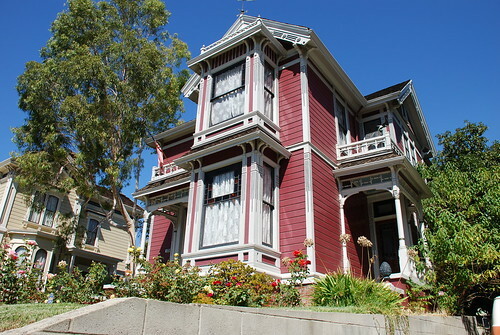 Produced in piecemeal in a factory somewhere else and shipped to the Angelino Heights address, it was then assembled by local workers. As in front of the Russell House, an original carriage block still stands on the sidewalk of 1324. The hitching post and streetlight are also vintage, but not original to the site. Not every home on the 1300 block of Carroll Avenue is a city landmark. 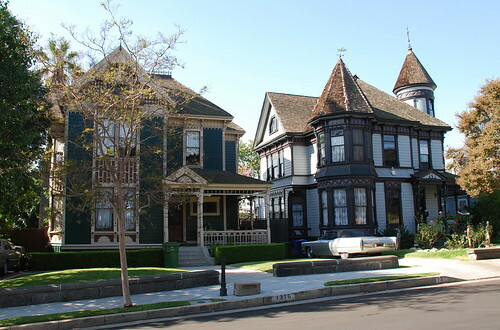 However, the entire block is listed on the National Register of Historic Places and stands as the core of the Angelino Heights Historic Preservation Overlay Zone. 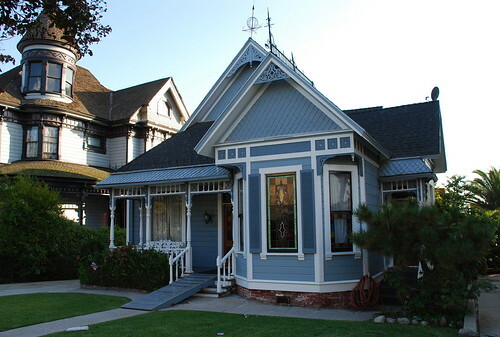 One of the homes not a Los Angeles monument is the five-bedroom craftsman/bungalow below. Situated at 1340 Carroll, this 1907 home, in my opinion, could easily be one of the block's highlights with just a little paint, tree-trimming, and free beer and pretzels handed out to bloggers. Picture Album of Historic Angelino Heights, a 1978 brochure put out by the Carroll Avenue Restoration Foundation, says James B. Mayer, proprietor of the Southern Pacific Truck Company, was the first owner of this (mainly) Queen Anne home. 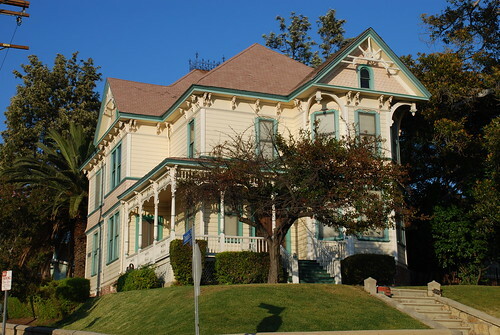 However, Angelino Heights: The Victorians of Carroll Avenue, a 2002 Los Angeles Conservancy pamphlet, reports the house was built for brewer Ferdinand A. Heim. 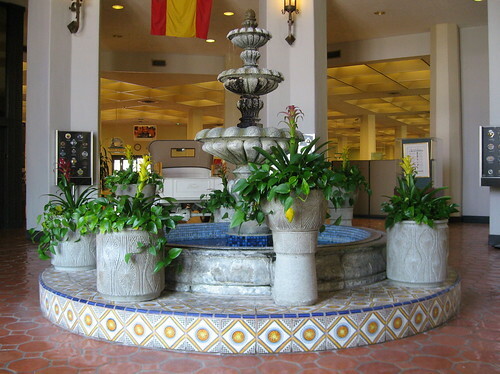 In either case, Historic-Cultural Monument No. 77 is known for the Heims, who occupied the home for more than half a century. Heim’s son, another Ferdinand, lived here until his 1943 death. This means it was he who first broke up the house into apartments in 1937. In a 1939 census, someone (we can assume it was Ferdinand) said he had lived in the home for 49 years. I’m no mathlete, but this would mean the Heims first took up residence here around 1890, a couple of years after the house was built. It wasn’t until 1970 when the current owner (who also owns the Innes House across the street) began converting the home back into a single-family dwelling. 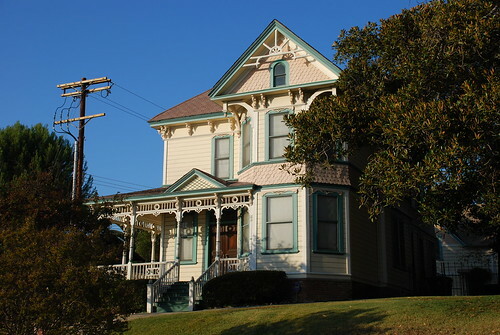 If you take the Conservancy’s walking tour of Angelino Heights, you’ll be invited to take a look around the inside of this house. 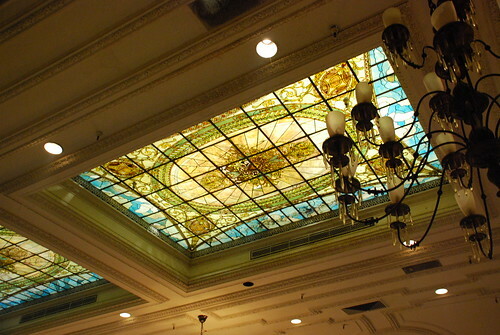 It’s fantastically restored with period furniture and vintage decorations. 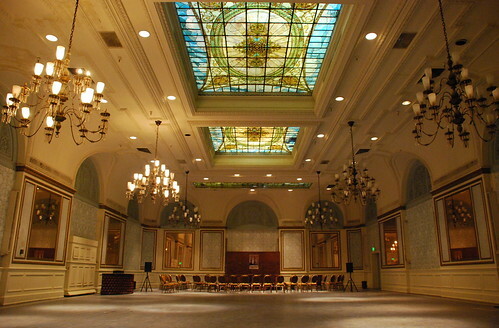 There are some original floors, wood trim, and fireplaces. And they let you use the bathroom, too. Take note of the grasshopper weathervane above. 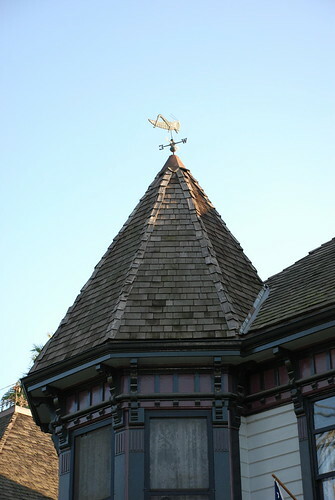 I’m going to take a wild shot in the dark and guess that Heim, or Mayer, or the current owner, (whoever put the vane up there), was a Bostonian. Finally, a two-for-one shot of the Heim House and HCM No. 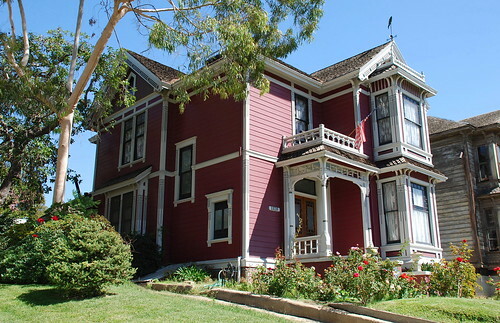 76, the Russell House. (Note the old carriage block/stepping stone beside the hitching post). 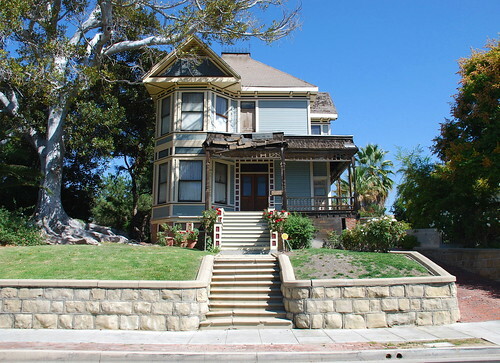 Named for the home’s second owner, retired miner and real estate man Major Horace M. Russell, this Eastlake house marks the halfway point in this group of seven Carroll Avenue homes designated Los Angeles monuments on the third day of February, 1971, the day Jay C. Flippen died. 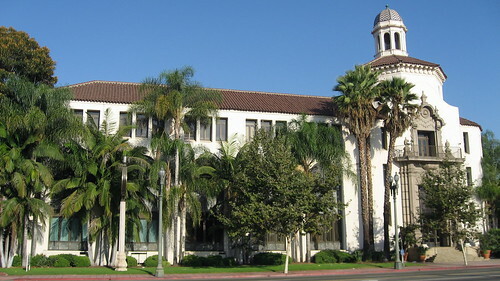 The first owner was George O. Ford, an agent for the Richfield Land and Water Company. 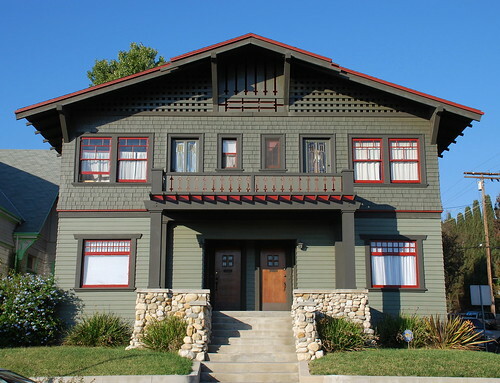 As early as the 1920s the make-up of Angelino Heights residents - and its houses - changed. Many of the Carroll Avenue homes were converted into multi-unit apartment buildings. A WPA census from the summer of 1939 shows 1316 Carroll carved up into five apartments with seven residents, four singles and a family of three. Rents ranged from $10 to $14. 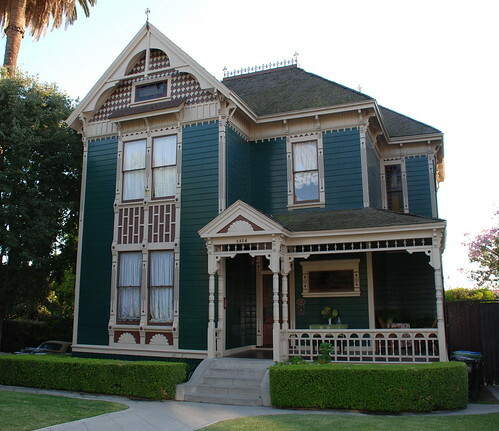 By the way, 1887 is the date of construction given in the L.A. Conservancy’s brochure, Angelino Heights: The Victorians of Carroll Avenue. Gebhard and Winter say 1887-1888. And ZIMAS gives 1889. 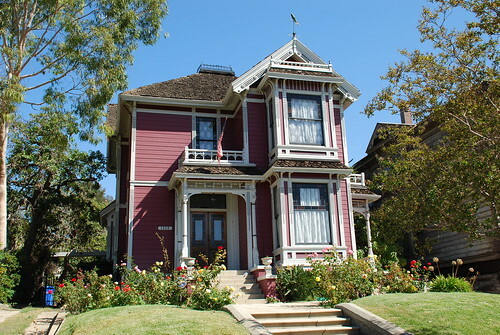 However, a 1994 Cultural Heritage Commission source gives “circa 1880”, and McGrew and Julian, in Landmarks of Los Angeles, maintain the home was built prior to 1880. 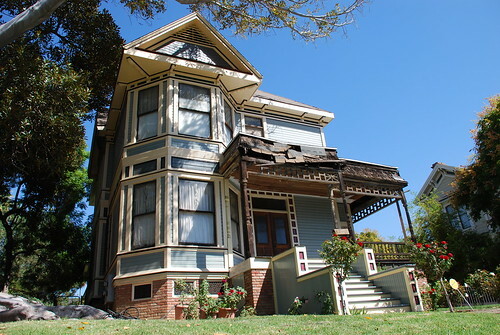 Since Messrs Stilson and Hall didn’t file for subdivision of the Angelino Heights tract until the end of the spring in 1886, I’m choosing the later date of 1887. 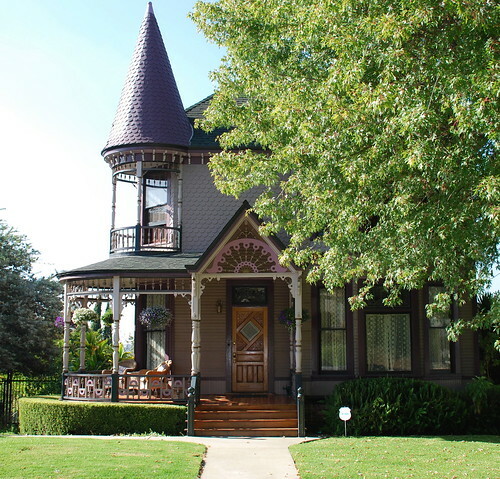 Mainly Eastlake in style, the Pinney House was built in 1887 for its namesake, industrialist Harry L. Pinney. 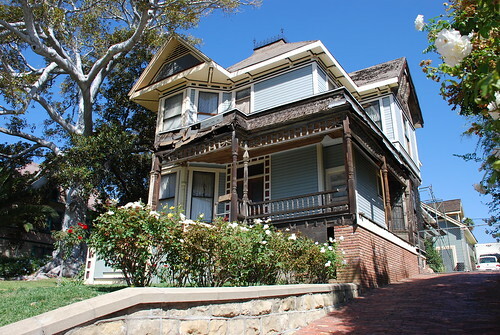 The L.A. Conservancy’s Angelino Heights: The Victorians of Carroll Avenue brochure says the big Moreton Bay Fig Tree between the Pinney House and the Sanders House is original to the site and belongs to the former, but I already mentioned it in the Sanders post. 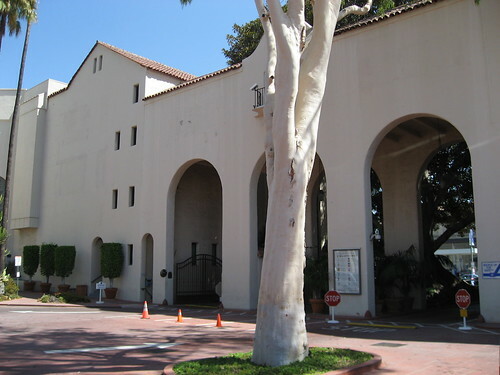 For what it’s worth, my 1994 edition of Landmarks of Los Angeles, a book I use as a nearly constant resource for this blog, goofs in switching up the Pinney House with the Haskin House (HCM No. 79), even mislabeling the picture of the latter. 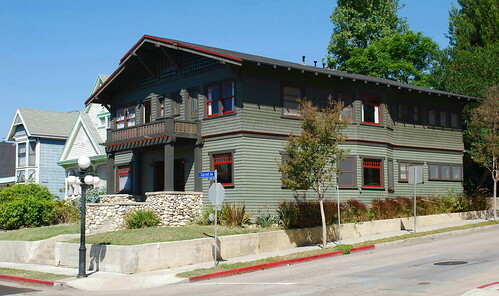 Sitting across the street from the Pinney House at 1401 Carroll Avenue is this army green Craftsman/Bungalow apartment house. 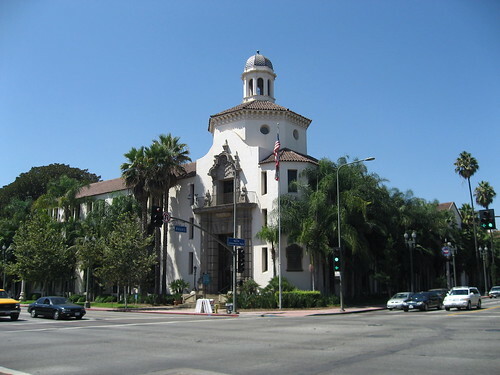 Now, this building isn’t a Historic-Cultural Landmark, but it is included in the Angelino Heights Historic Preservation Overlay Zone. 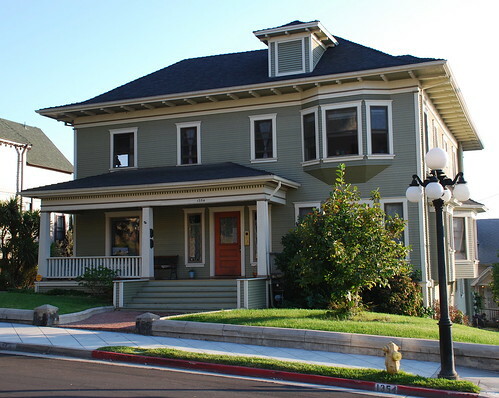 By the time this four-unit building was built in 1912, the Victorian style of architecture was very last century. I snapped this post’s top three pictures late in the afternoon, therefore the peachy look. I’ll chuck in one other taken in late morning, showing the Pinney House more in the pink. Or salmon. You’ll have to see the house in person to figure out which is more accurate. 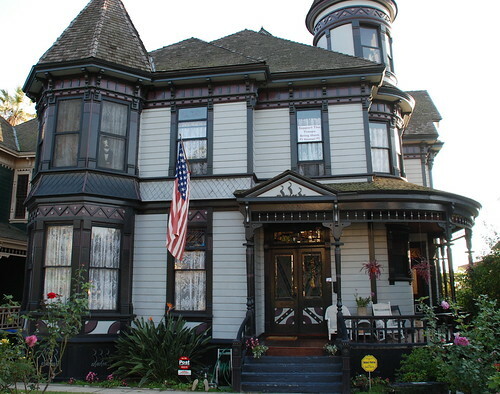 Michael Sanders was a warehouse operator back in 1887 when he became the first owner of this Queen Anne/Eastlake home. 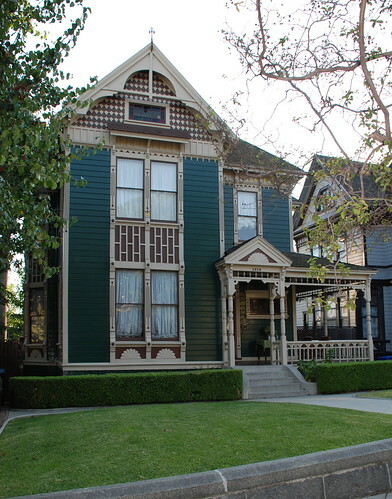 According to the Picture Album of Historic Angelino Heights (Carroll Avenue Restoration Foundation, 1987), the porch was modified way back when the house was converted to a two-family residence. 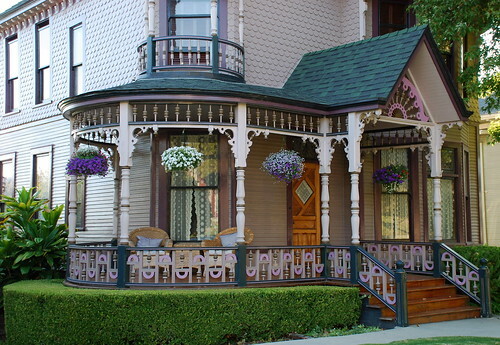 Speaking of the porch, why is it all ratty, considering the rest of the home is so well restored? Funds run out? Or maybe it’s some sort of statement, preserving the unpreserved. Search me. 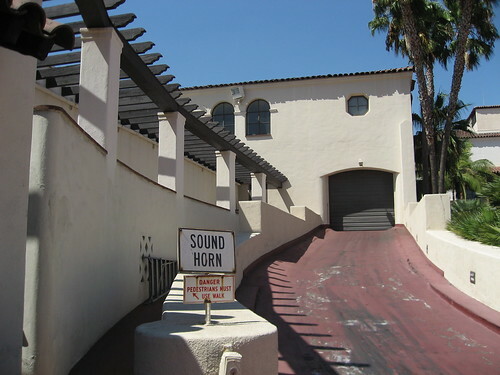 If you took the Los Angeles Conservancy walking tour of the block, you’d know that while the driveway leading up to the old carriage house was originally brick, this one’s a replacement. 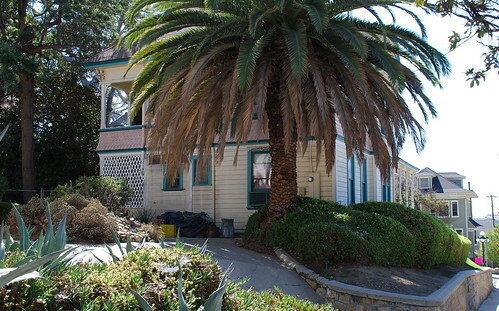 What is original to the site, however, is that big old Moreton Bay Fig Tree beside the house. 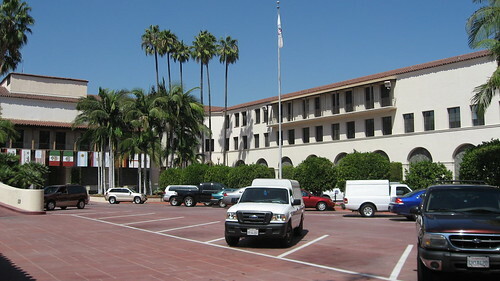 In fact, it dates back to the area’s initial development by William W. Stilson and Everett E. Hall (the guys filed for subdivision of the tract on March 19, 1886). 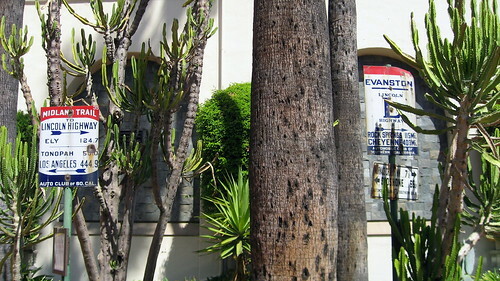 Like the houses on either side of it, the tree, too, is protected. 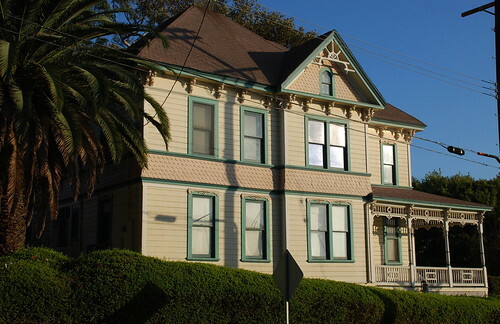 The Innes House, built in 1887 in the Eastlake style for real estate developer/shoe store magnate/city councilman Daniel Innes, is the first of seven homes in the 1300 block of Carroll Avenue to be designated a city landmark on February 3, 1971. 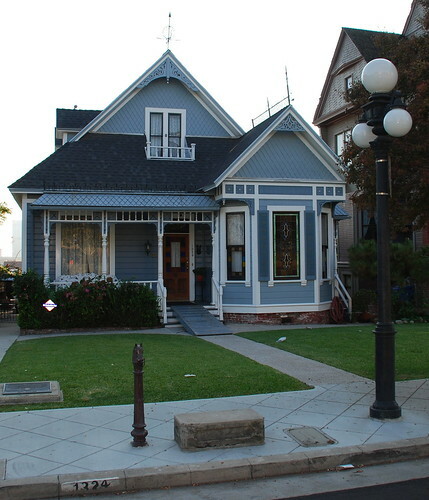 Los Angeles’s Department of City Planning’s Zone Information and Map Access System (ZIMAS) lists the year of construction of the Innes House as 1903. If you’ve got the energy to research why there’s the discrepancy between this and nearly every other source I've seen, let me know. I choose to believe the earlier date of 1887. 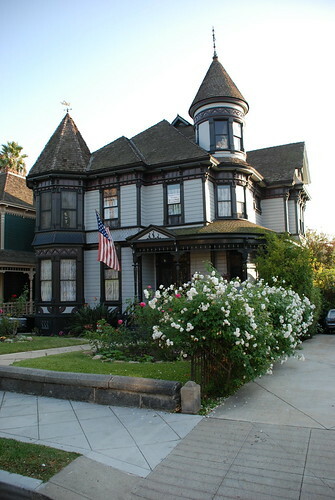 Barber Dominic Iannorone bought the house in 1920, living there until 1971 (the year of the house’s designation). 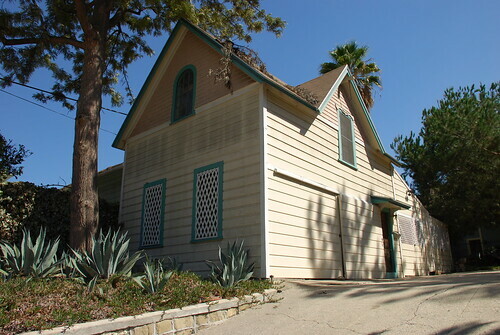 The Innes House was one of two homes opened for visiting on a recent Los Angeles Conservancy walking tour of the block ($5 for members – cheap!). 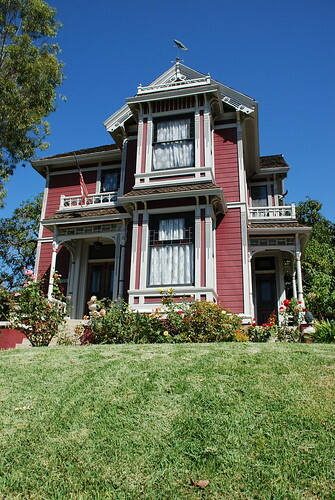 The second floor (off limits) is used as a residence, but the first is rented out for filming TV shows and movies like Charmed and Little Women and Of Mice and Men. To see: the sliding door separating the back parlor and dining room (it’s got its original 120-year-old finish), the kitchen’s original floor, the coved ceilings, the slate and cast iron fireplaces fauxed up to look like marble and wood, and the snowflakes etched into the window insets. 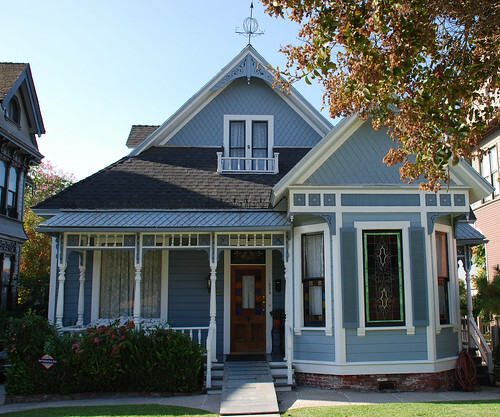 Plus, if you take the tour, you walk away with a nice little brochure by Cindy Olnick, Angelino Heights: The Victorians of Carroll Avenue. 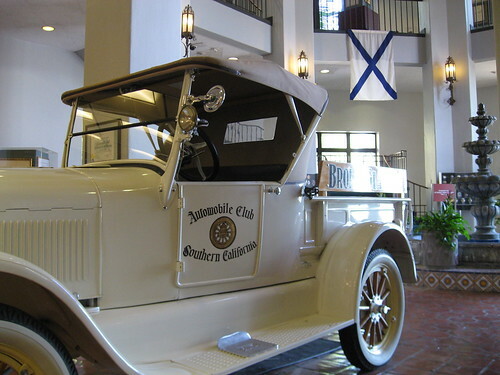 Predating Triple A by two years, the Automobile Club of Southern California was formed in Los Angeles in 1900. An L.A. Times article from that year reported the club’s first country run “proved successful in every aspect”. A group of eight cars – “automobiles propelled by steam only were used, as the distance was too great for electrics” – took a five-hour drive from L.A. to Ontario on Saturday, the first day of December. 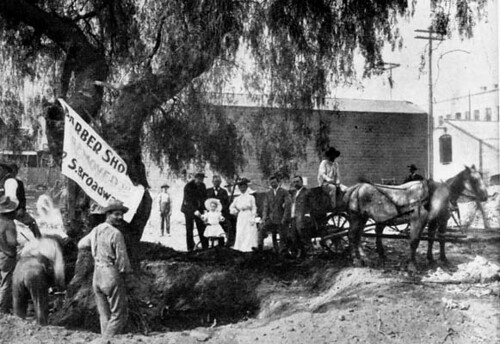 While that trip went well, the group had to ford the San Gabriel River in Azusa on its return journey the next day. 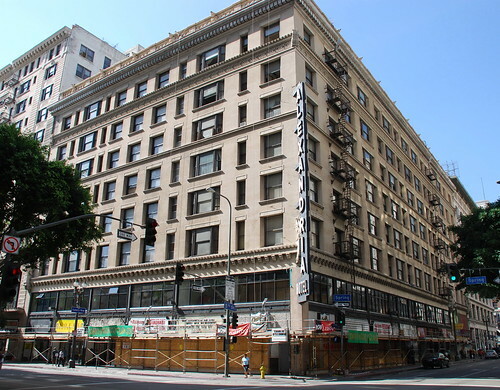 From 1914 until it moved into its current headquarters, the Automobile Club occupied the spot above at 1344 South Figueroa, just below Pico, across from where the Staples Center is today. 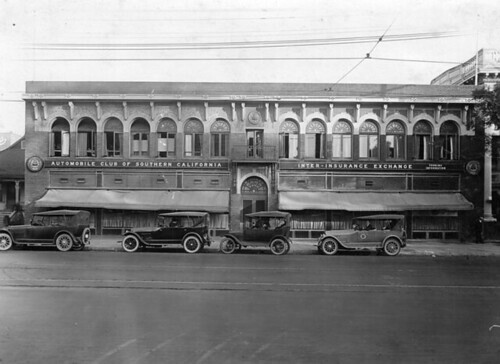 While the club announced plans for its new home in the beginning of the summer in 1921 (the organization had already owned the land since the year before), it didn’t occupy the site until February, 1923. 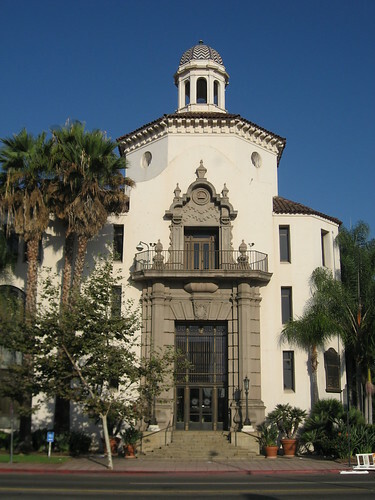 The three-story, L-shaped Spanish Colonial Revival building was designed by Sumner P. Hunt and Silas R. Burns. Aurele Vermeulen was the landscape architect. 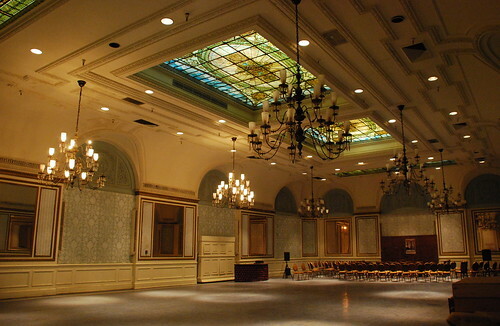 At the time of the new building’s opening, club membership exceeded 56,000. 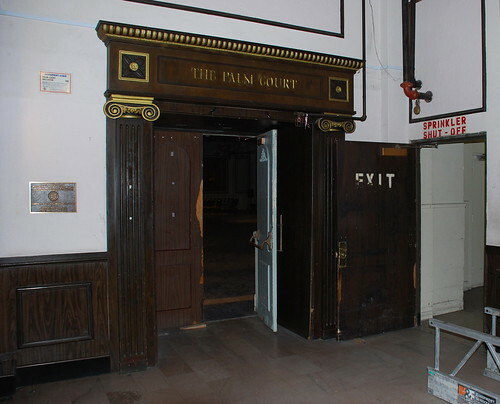 Upon opening, the basement held the men’s locker rooms and showers, the main floor was for general offices, the second floor was for women’s lockers and restrooms and more general offices, and the third floor was all about the dining room, kitchens, a men’s lounge and smoking room, a large assembly room, and the director’s room. 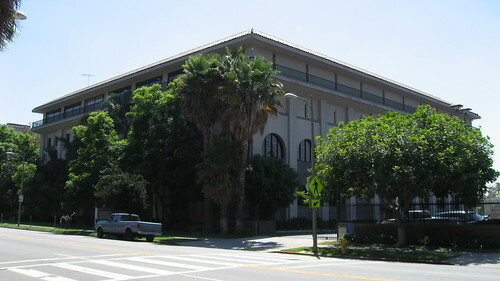 The West Adams Boulevard side. 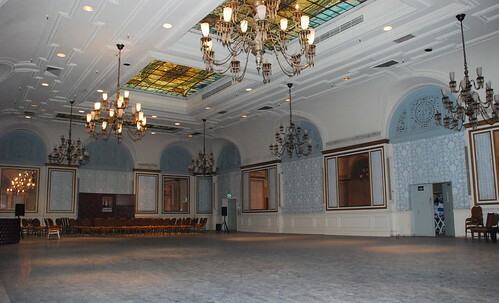 Below’s a shot of the club building’s 150,000-square-feet addition, designed by Allison, Rible, Robinson & Ziegler, and built from 1969 to 1970. 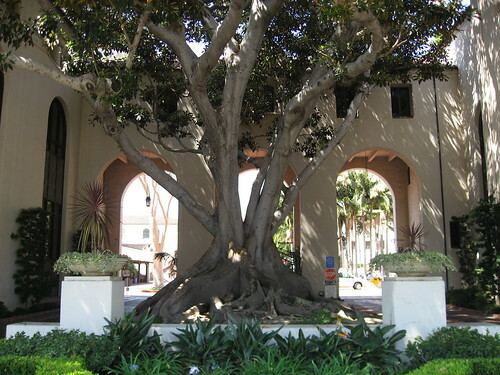 A giant Moreton Bay Fig Tree guards the Figueroa entrance to the central courtyard. There are a bunch of signs (and an El Camino Real Bell) throughout the club’s compound, like these two – one for the Midland Trail, the other for the Lincoln Highway. The Midland Trail was the only direct connection between Los Angeles and Salt Lake City. The Lincoln Highway, the "First Road Across America", hooked up with the Midland Trail and headed out to Omaha, Nebraska. The signs date from around 1915. 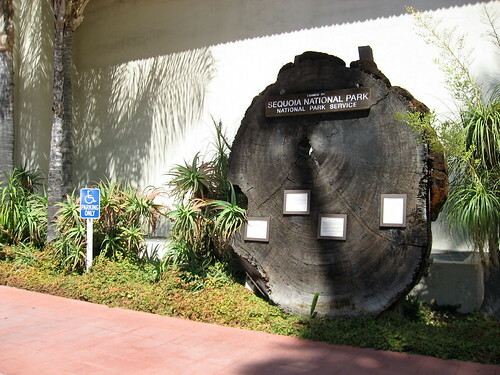 One thing I did not expect to see at the Automobile Club was a big slice “from a tree called Sequoia gigantean, commonly known as the Big Tree, which fell in Sequoia National Park during 1933. 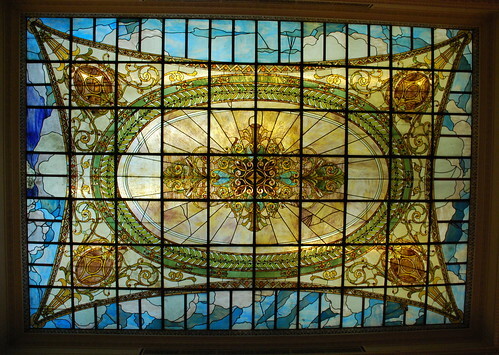 Its measurements are 11 feet 9 inches across the vertical diameter…” It’s figured the tree dates back to 483 A.D.
A couple of shots inside the Automobile Club lobby, including this of the fountain. 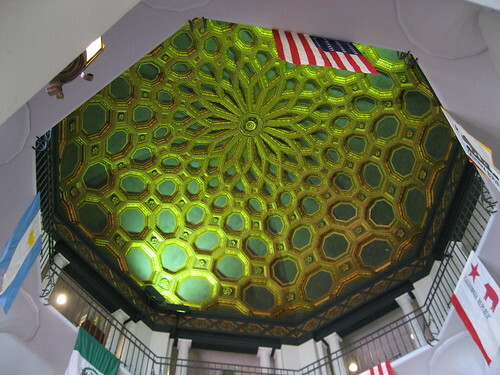 The octagonal-shaped lobby’s stretches up to the third floor rotunda. 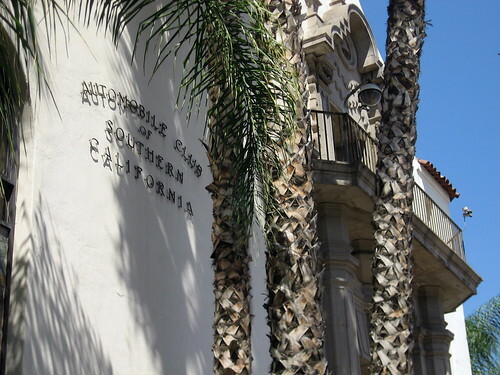 The Automobile Club of Southern California has a collection of more than 1000 photos and about 100 strip maps at USC’s Digital Archive. 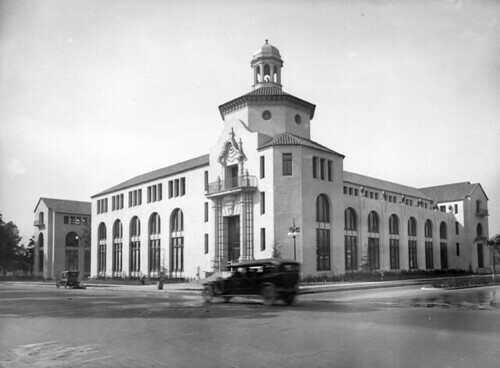 However, the two black and white photographs in this post are from the city's Public Library photo collection. This here shot must've been taken while the concrete was still wet.